This piece is for the Simon Says Stamp Monday Challenge. I started the background with various shades of blue using Inktense blocks and then covered them with Golden High Flow in Iridescent Pearl. I stamped using a a cloud stamp but it was too subtle so changed to a honeycomb stamps with SSS Hybrid in Audrey Blue and used this around the edges as well. 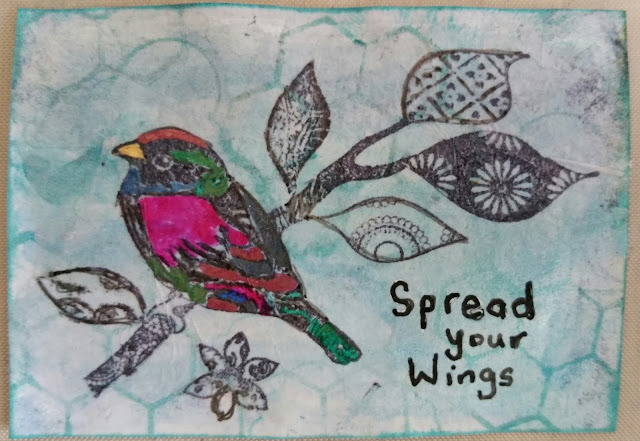 The bird is from Crafty Individuals and was stamped onto tissue and applied with Mod Podge Paper, then coloured with Sakura Gelli Roll pens. A simple ATC sized piece that I may use on a card as some stage.